Muffler Men are a funny bunch. Clearly they need looking after and checking in on now and then. 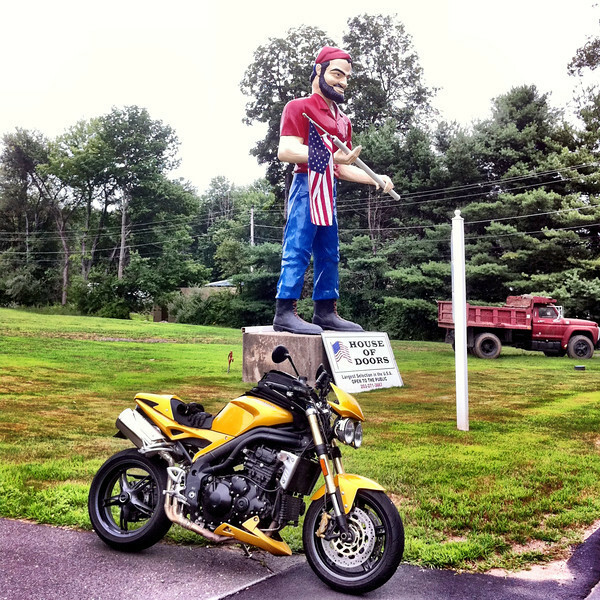 The last time I was in the neighborhood in 2009, I stopped in to take a peek at the Bunyan-style Muffler Man that hangs out at the House of Doors. He was looking good then and I’m happy to report in 2011 he is still looking fab. My prior visit in 2007 would’ve made a grown man weep. Pants. Nothing but pants. Tragic, right? Wanna see one in the flesh? Then say hello to RoadsideAmerica.com’s Muffler Man Tracking Chart. It’s your new best friend.